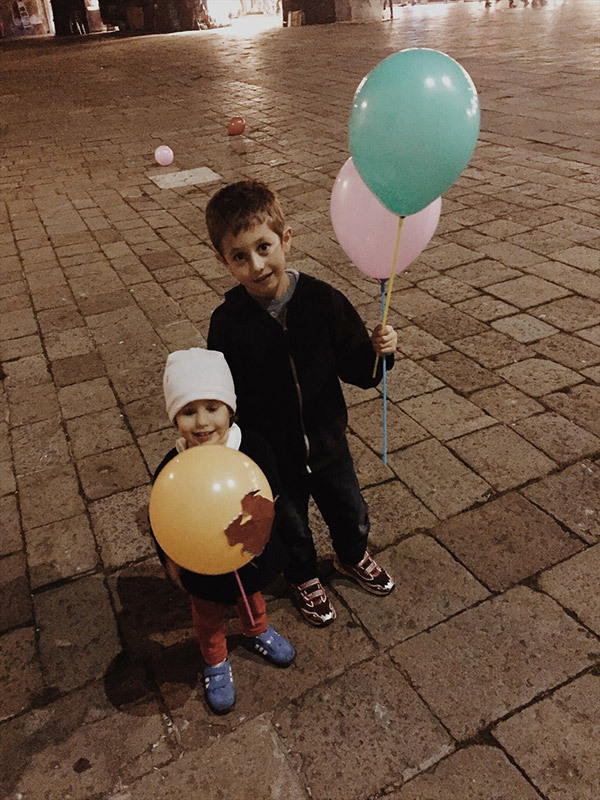 Chiara, blogger from My Wander Coffee, is an Italian mom with two children who recently took a trip to Venice, Italy. 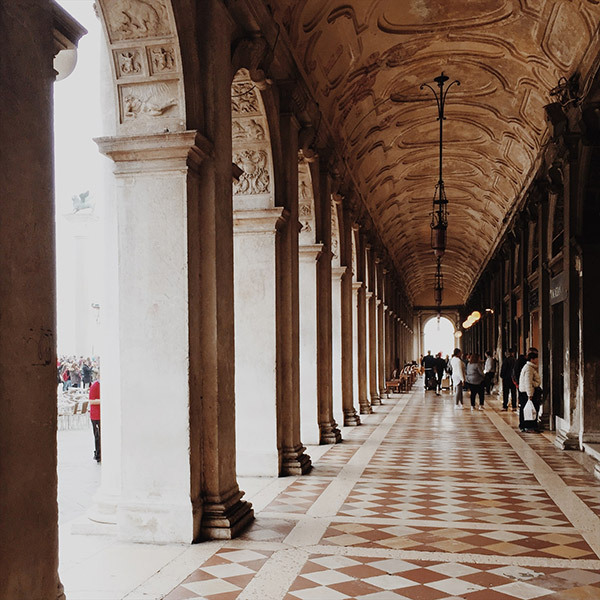 Following her 24 hour trip to Venice alone with her two kids, she decided to share a few handy tips to make it easier to get around this beautiful city. As a big lover of family travel, Yoyo Mom is very happy to share her experience. Thank you Chiara! A mom, two kids, a stroller, two luggages and 24 hours in Venice. What looks like to be an impossible mission, made easier. When the vacation break arrives, I’m always a bit torn about what to do with the kids. Hubby has to work long hours so the prospect of staying home two long weeks with the kids is an effective and quick way to book a flight. This year, the weather has been particularly balmy so going to Italy was an attractive option (plus some time off for myself was very much needed!). 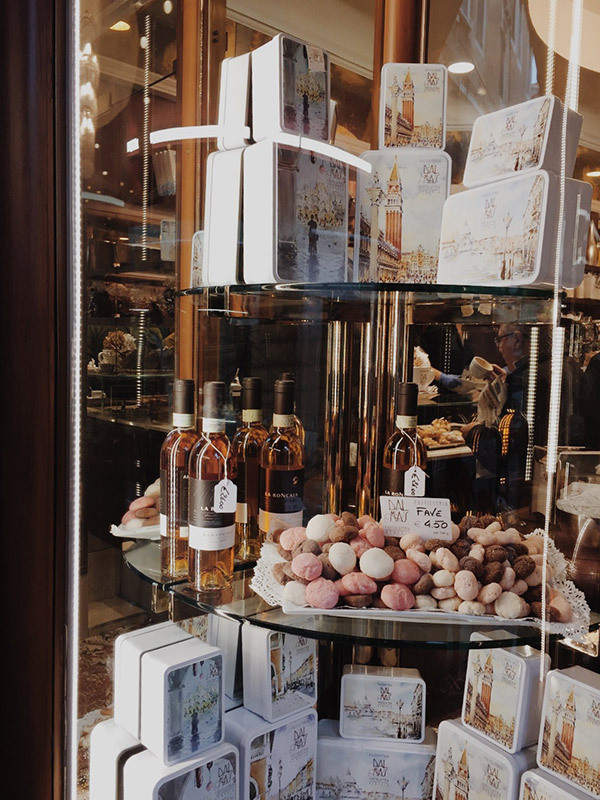 We flew to Venice in the early morning and found a sunny laguna welcoming us: it was lovely… Until I realised I had two huge suitcases, a buggy with a 2 year old in it, and a 6 year old staring through the window of a pastry shop. To panic or not to panic? Absolutely not! It was my first time alone with the children, but I’ve got us covered with a few tips I would like to share. 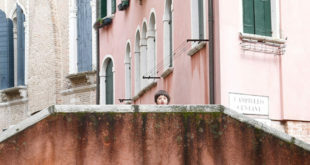 If you happen to be planning a trip with the kids in the unique city of Venice, you may want to note down a few of the following tips. 1) There are other moms living in Venice and they are all surviving motherhood. They get out every day and manage to get all of their usual chores done. Being a mother in Venice is surely harder than dwelling with a toddler on a beach in Bermuda (well, I actually don’t know it for sure, but maybe some of you can shed some light on the matter), but it can be done! 2) If you are arriving by train and plan to stay overnight, be sure to book a hotel close to the train station VENEZIA SANTA LUCIA. In my experience, the best location is between the train station and the PONTE DELLE GUGLIE. If you have suitcases or a buggy, it won’t take too much time to arrive at the hotel and you won’t have to cross over any bridges. Also, try to make sure the hotel has a lift to the floors or at least a storage room where you can leave your suitcases and/or the stroller. You may also want to visit a garden close by such as PARCO SAVORGNAN and give the kids some time to run around freely. You’ll definitely want to stop by the Bar Dal Mas for a great coffee and delicious pistachio cream filled pastries. If you arrive by car or by bus, precisely at Piazzale Roma, remember you will have to cross a large bridge which is not easy with the kids. Think about it when planning your arrival and your hotel accommodations. 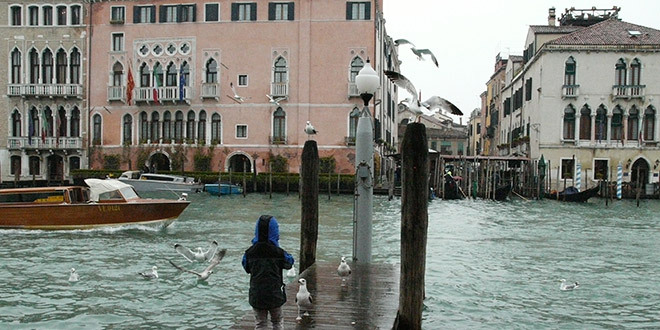 3) When in Venice, you’ll most likely want to visit the PIAZZA SAN MARCO and let your children run free and chase the pigeons (just remember to not feed the birds or you will be fined)! This is the only true square of Venice: the other smaller squares you will spot are called “campielli e call”, but yes, children are also free to run there too. St. Mark’s Square is a famous monument, surrounded by striking buildings full of history such as the BASILICA, the PALAZZO DUCALE, the PROCURATIE and the towering CAMPANILE. Just beside the Piazza, you will find the GIARDINI REALI (the Royal Gardens), where you can also let the kids play while you rest. 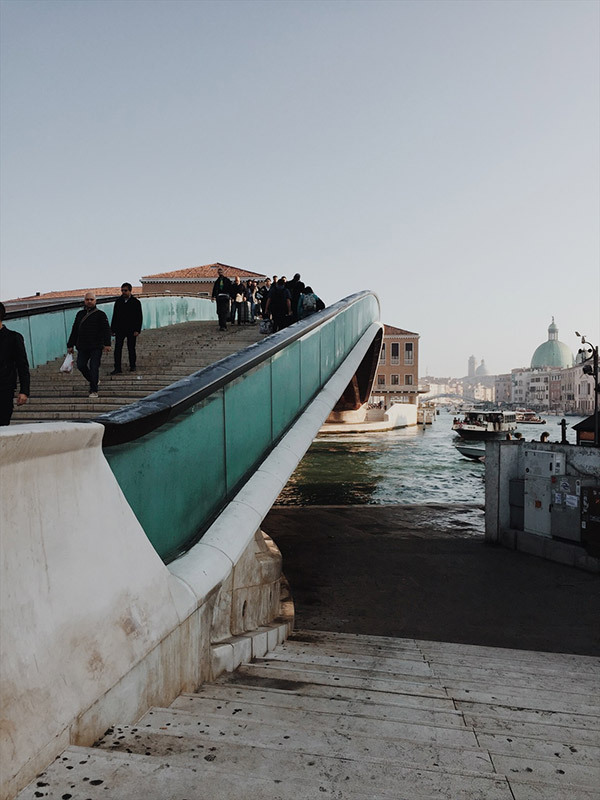 With a map in your hand, you will recognise there is a PATH to St. Mark’s Square, that runs around the CANAL GRANDE, with fewer bridges to cross. Here is a link (http://bit.ly/2xl2ZbQ) to a quick map I have created for you. Follow the yellow brick road! 4) Another handy tip many mothers I have met don’t seem to know yet is to REVERSE YOUR STROLLER when passing over a bridge. Pull the stroller as you climb the stairs backwards. It sounds complicated, but it’s easier than the option to lift the buggy with your kid on it! If you are lucky enough to own a Bugaboo, you may know this already. If going up stairs like this is still too much for you, just wait. There will always be someone around happy to help you and if not, you can always ask. Have faith in people. You will be amazed by the kindness you encounter when you are positive about it! 5) AVOID HIGH SEASON. This is another piece of advice that I can offer. When Venice is not packed with tourists, you will find yourself in a happier, easier and smoother place. It is definitely better to choose Venice during off-peak seasons. 6) Taking a VAPORETTO (water bus) is a good option, if you like to move quickly from one point to another. Again, try to avoid rush hour, otherwise you will spend most of the time on a floating platform, waiting for the boat to arrive. Also, travelling on the vaporetto with a stroller and baggage when the boat is full is an experience that I don’t particularly recommend. You may want to opt for a water taxi but mind you, it is expensive indeed. A good reason to take the vaporetto is to reach the LIDO DI VENEZIA which is an ideal family spot. It doesn’t have to be Summer to go. If you are a bit like me, I enjoy looking at the sea at every time of the year. 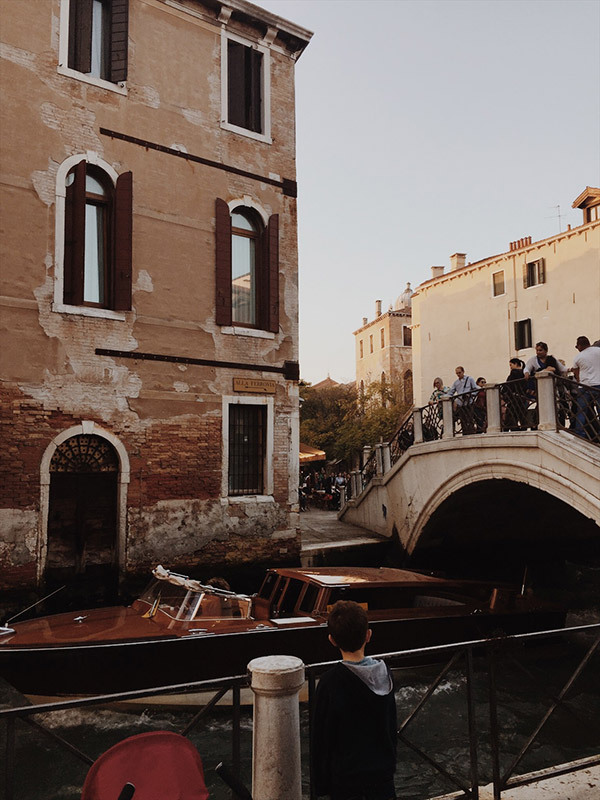 The island of Lido is a fifteen minute ride from Piazza San Marco. You will find public and private beaches and in both ways you will have some time to relax and pat yourself on the back: you made it to the final level of another great adventure with your kids!